This group of particles is from an oil sample collected from a 8400kVA transformer. This transformer was reportedly gas blanketed and sealed. The bright mineral particle near the center of this field of view suggest contamination from the exterior environment. 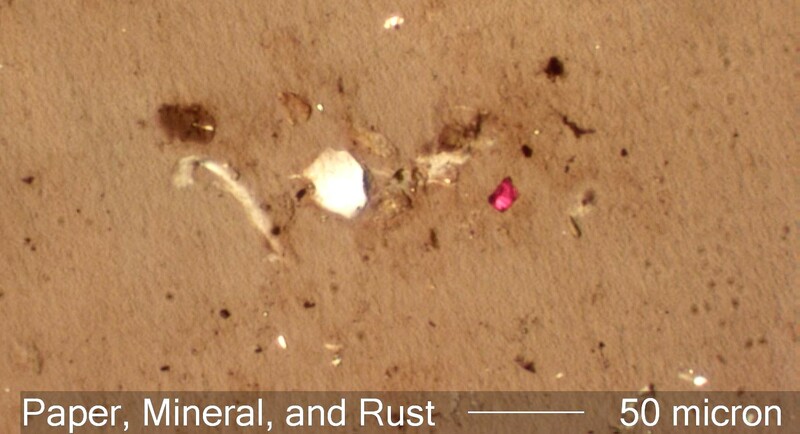 There are a number of degraded paper fibers evident here to both the right and left of the mineral grain. The bright red particle in the field is a grain of hemetite, iron oxide. Hemetite may be present as a contaminating foreign mineral grain or as a result of rust. The lack of significant amounts of liminite in this sample suggest that this hemetite particle is a foreign contaminant.